If you ask me, tornadoes are one of the most gorgeous things on earth. That’s not to say that I wish for them to happen simply so someone can photograph them. 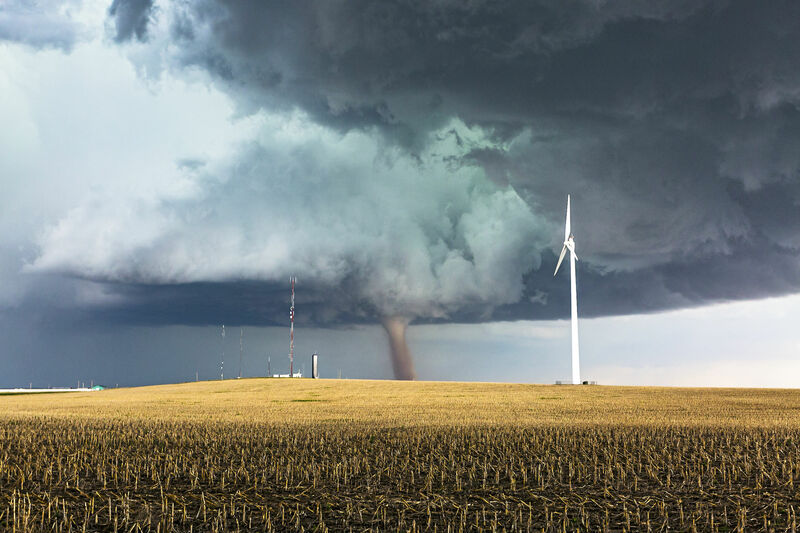 Though tornadoes are among the planet's most destructive of natural forces, there is something about them that intrigues photographers, myself included. 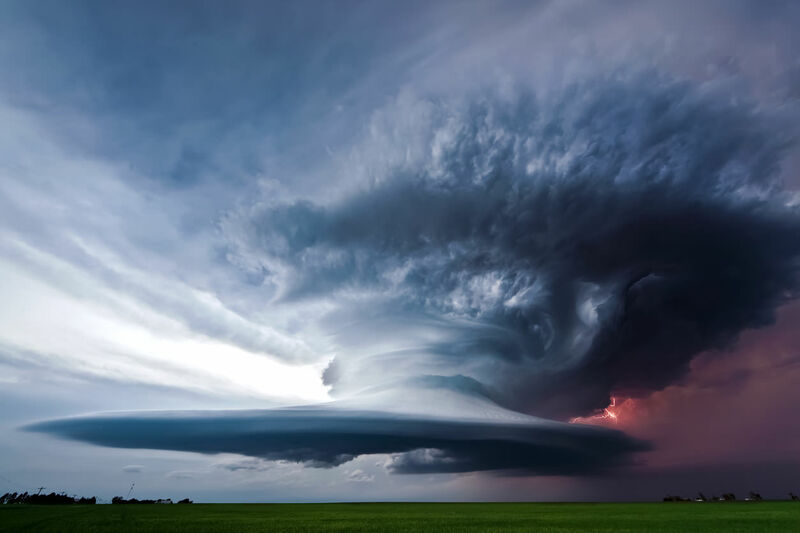 There are plenty of elements in supercell storms that make for an interesting photo as well. Between the two, there are endless opportunities for showing nature’s wrath, but doing so in a way that helps viewers appreciate their beauty at the same time. 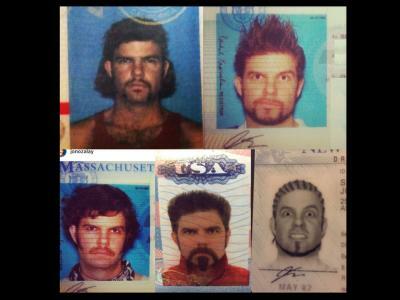 Below I’ve gathered up 12 incredible photos of tornados and supercells. 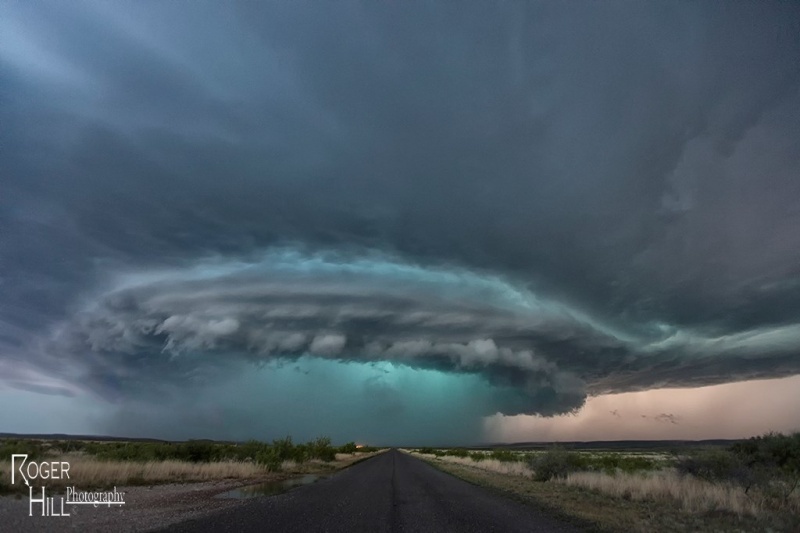 Each highlights the sheer beauty of this natural phenomenon and shows that when photographers pursue storms in a manner that is safe, gorgeous photos can be had. Even when photographing something as visually powerful as a tornado, it’s important to remember basic rules of composition. The low horizon gives a better view of the sky, and the inclusion of a little bit of foreground adds depth to the shot. What’s more, the green field juxtaposes nicely with the dark gray and blue sky, giving the shot added color contrast as well. 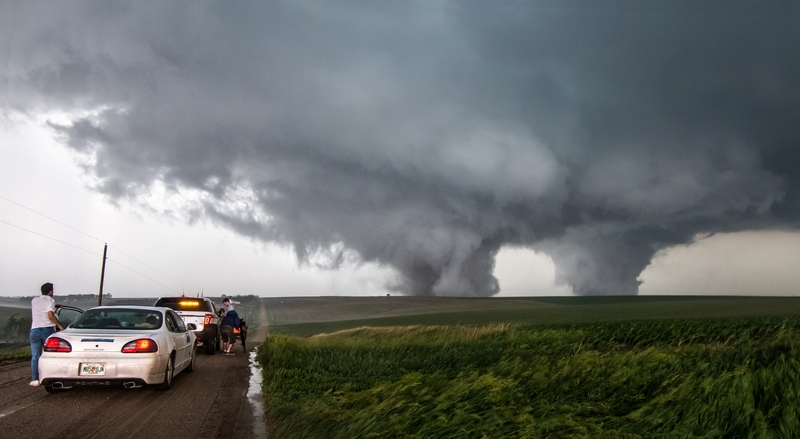 On June 16, 2014, Aaron chased these twin EF4 tornadoes across the Nebraska landscape. This rare occurrence made for an interesting photo, one that shows the raw power of nature but does so in a way that is supremely balanced. The small building on the horizon (just to the left of the leftmost tornado) gives some context to the sheer size of the storm. 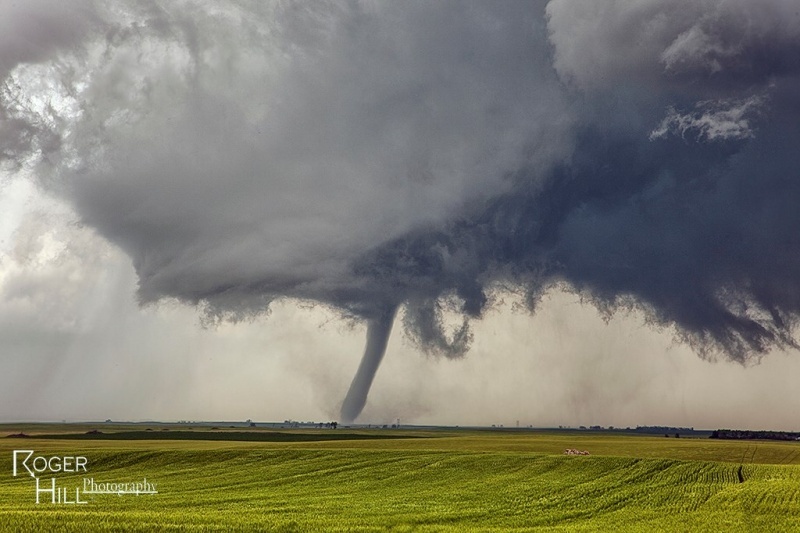 This tornado, photographed in South Dakota, is nearly pure white, making it stand out against the dark and ominous skies behind it. 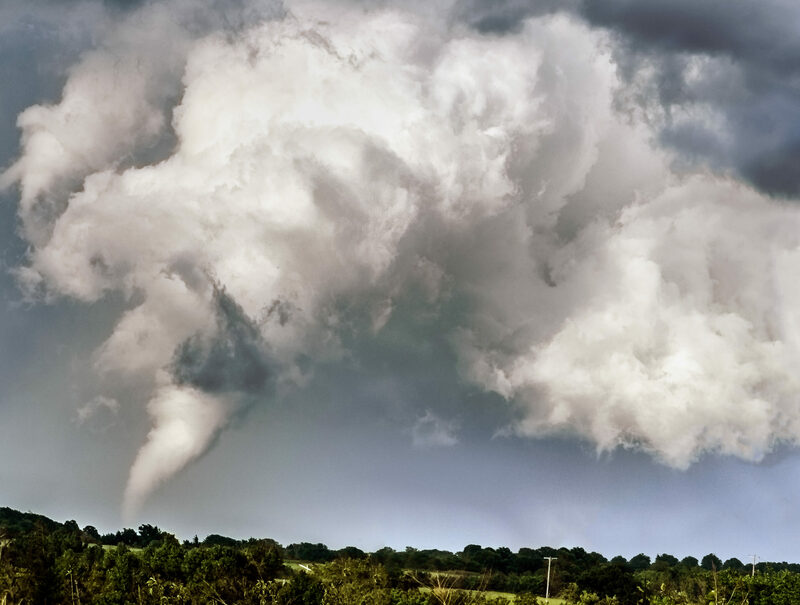 By framing the tornado in the middle of the image, Roger was able to use it as a leading line up toward the expansive clouds above. Note the telephone poles along the horizon and how tiny they seem compared to the massive storm. 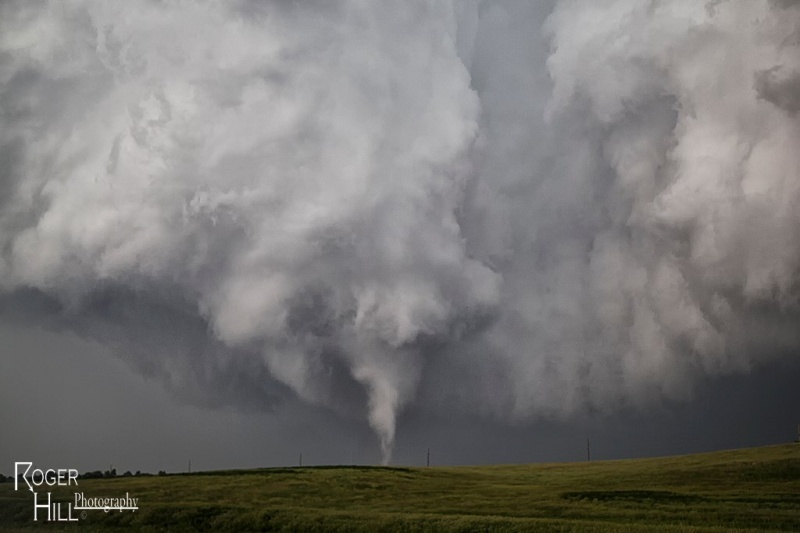 In this example, we again see the value of framing the tornado with elements that are of a familiar size so that we get a better sense of the enormity of the funnel. Here, even though the tornado is much more distant than the communication tower and wind generator, it still appears quite massive. The detailing in the foreground field and the clouds above add nice texture to the shot as well. Sometimes, the most beautiful moment to capture a photo of a storm is in the minutes leading up to it becoming tornadic. In this case, you get a sense of the rotation of the supercell as air is drawn into it from right to left. 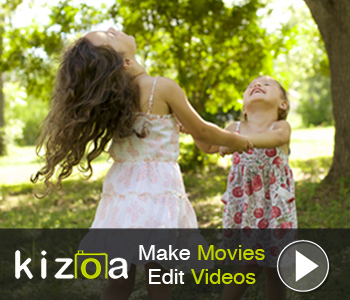 These bands of clouds act as leading lines that make the photo much more interactive. Other leading lines - namely the highway and the telephone lines - also help direct attention to the eye of the storm. 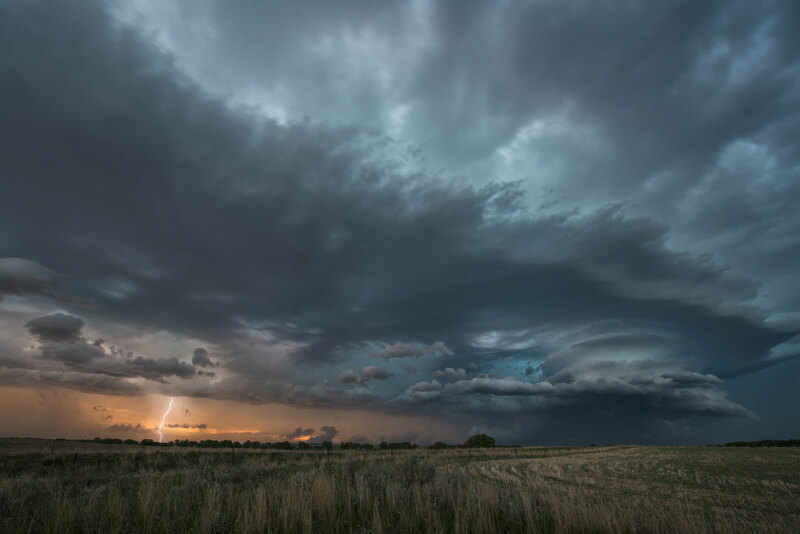 Even after the sunset, there are plenty of opportunities to photograph tornadoes and supercell storms. 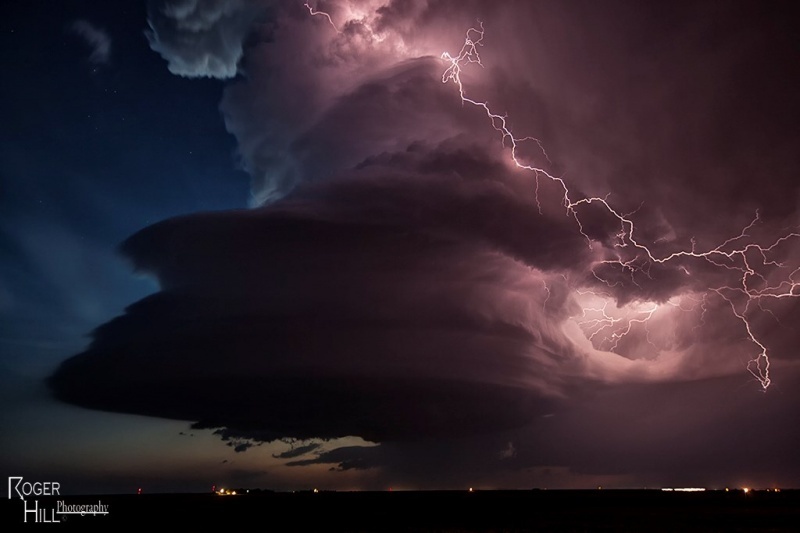 In this case, the massive bolts of lightning illuminate the supercell, accentuating its height and volume. Not only was this shot well-timed to take advantage of the lighting, but the inclusion of the city lights on the horizon help us to understand just how large this storm actually is. In some instances, the tornado isn’t necessarily the most beautiful thing about the image. In this case, I’d argue that the billowing clouds above it make a more impactful statement. The roiling clouds with their layers and textures give an incredible level of depth to the shot. The funnel cloud is certainly a beautiful bonus though! Not all photos of tornados and supercells have to include the entirety of the storm. In this case, the cropped view makes you feel as though you’re much closer to the storm - perhaps too close for comfort, in fact. Again, the inflow of air creates gorgeous lines in the sky that the eye can follow, and the soft, warm lighting peeking out from behind the storm adds just a hint of calm to an otherwise chaotic scene. 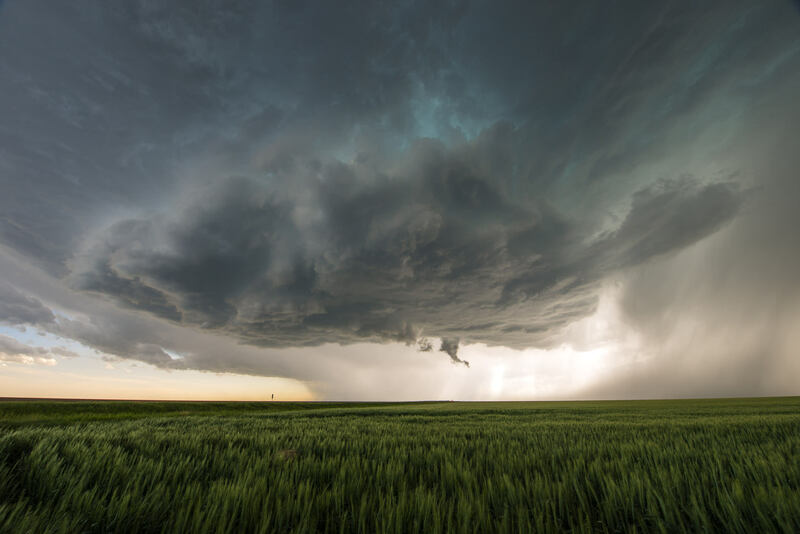 In this example, we see how using a wide-angle lens is beneficial for photographing supercells simply because of their massive width and height. By shifting the horizon downward, the photographer was able to capture as much of the sky as possible, creating a photo that has tons of depth and visual interest. The timing was also just right to capture a small bolt of lighting, which adds a further element of dynamism to the shot. 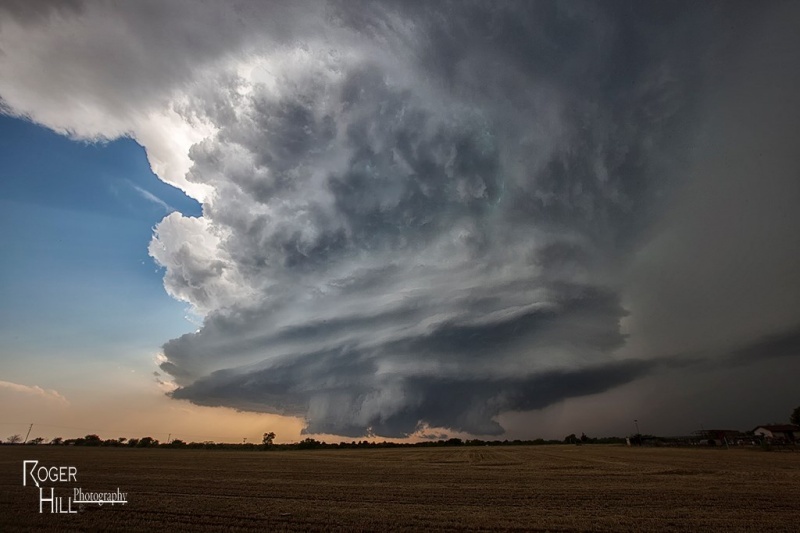 Supercell storms can reach heights of tens of thousands of feet, and capturing that loft can be difficult to do. Yet in this example, Roger frames the storm perfectly, aptly referring to it as a “mothership supercell” because of its UFO-like appearance. 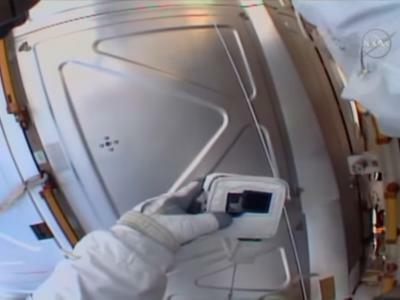 This image is a prime example of how the perspective of the shot can add interest. In this case, the backlighting helps define the storm and adds a bit of brightness to increase dynamic range. Antony Spencer catches the birth of a tornado in this shot. The backlighting behind the tiny, developing tornado adds drama to the photo while creating a perfect backdrop for the tornado. The texture in the foreground adds interest as well, and even acts as a leading line, directing our attention deeper into the shot. 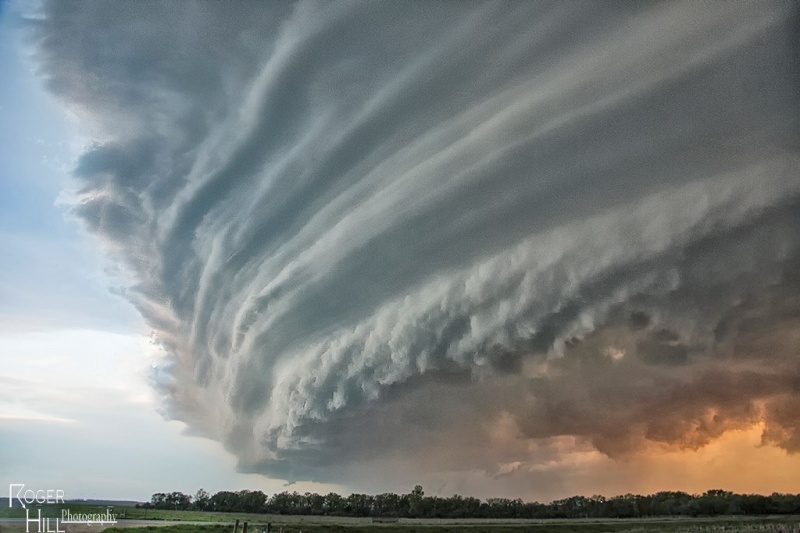 This supercell has incredible structure that makes it a gorgeous subject for this photo. But the addition of the ethereal blue light that seems to emanate from the storm adds a whole new level of interest. 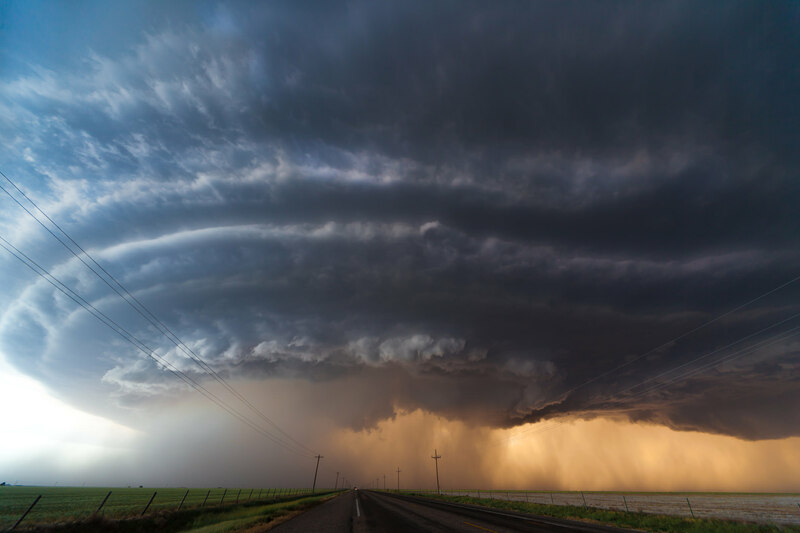 Like other shots on this list, the eye can follow the direction of air feeding into the storm, giving the eye something to follow around and inspect every aspect of the cloud structure.